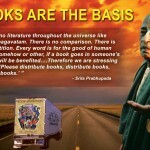 If you happen to be a smart reader, it is most likely that you stumbled upon at least some of the books authored by the lucky early birds of ISKCON, the historic movement that took off on this planet in America in 1965. Samuel Speerstra, who later became the famous Shyamsundar Das, is all set to publish his upcoming book “Chasing Rhinos With The Swami”. 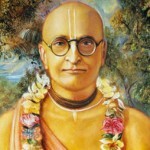 A. C. Bhaktivedanta Swami Prabhupad changed the world. When he came to America from India in 1965, few Westerners knew the deep spiritual truths behind ancient Vedic culture and civilization. Within a decade most humans on the planet had heard the Hare Krishna mantra. Shyamasundar Das (Sam Speerstra) was one of Prabhupad’s earliest disciples, helping him shape the Krishna Consciousness Movement in the Haight-Ashbury district of San Francisco, with the Beatles in London, and then, as the Swami’s personal secretary, in India, Russia, and all over the globe. Nothing was impossible for Srila Prabhupad, and he instilled this idea in the hearts of his first disciples: Go for the rhino! I was born in the body of Samuel Speerstra, in Salem, Oregon in May ,1942. From early childhood I thrived on adventure and risk. 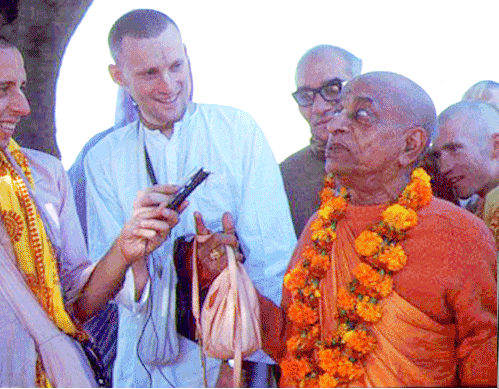 After graduating from Reed College in 1965, I met Bhaktivedanta Swami in San Francisco in January 1967, and immediately became his disciple Shyamasundar Das. The Swami wed me to my girlfriend Melanie (Malati Devi Dasi) in a smoke-filled storefront in Haight-Ashbury we called the Radha-Krishna Temple. 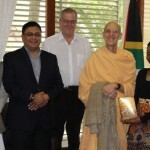 Again, if you are a smart reader, or have interest in reading one of the most impressive accounts of ISKCON’s early days with its founder-acharya, A.C. Bhaktivedanta Swami Prabhupada, you may want to visit http://chasingrhinos.com/ and learn more about the book. 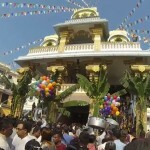 Since its inception, ISKCON, more commonly known as the Hare Krishna movement, has phenomenally spread across all the six continents of the world. As reported earlier in an article, this year it set two new world records for the Guinness book. Disclaimer: We have published this article only in order to let our readers know about this book launch. We do not financially benefit from the sale of this book nor do we claim to know the full content of it. Readers are requested to do their own research in areas of their concern.